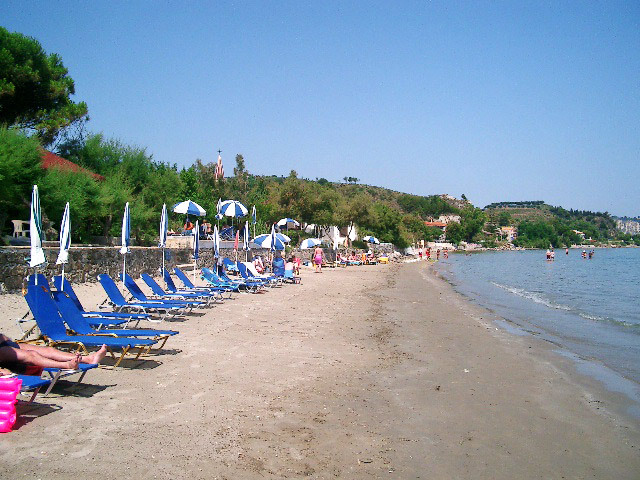 Beaches are ordered from the Northern to the Southern ones of the island. 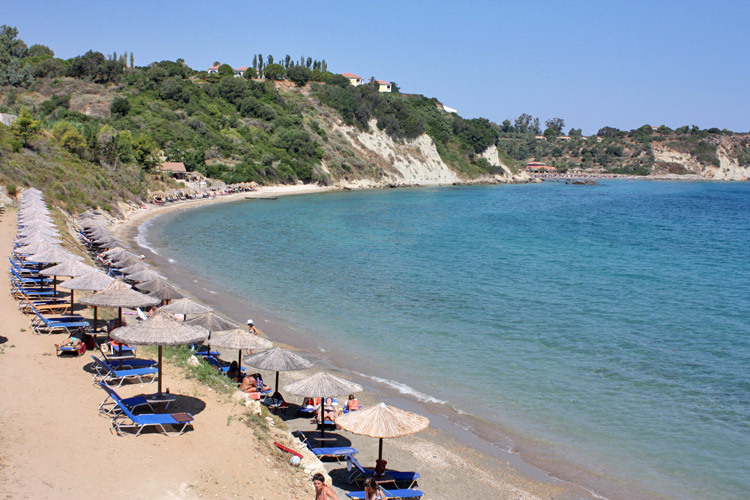 Agios Nikolaos Not to be confused with the Southern beach of the island that has the same name. 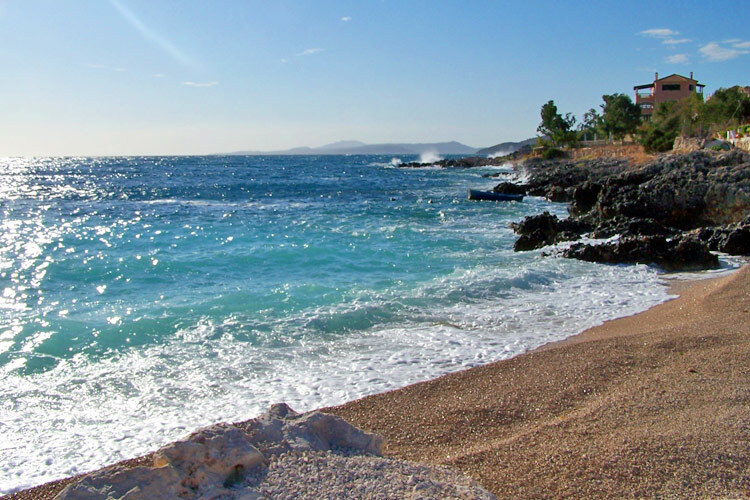 The beach of this village consists of small pebbles and it is rather deep. 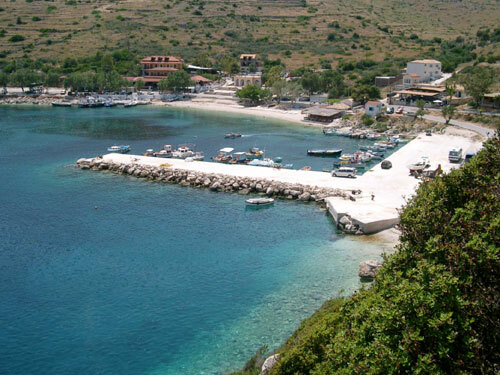 This is the only village from where the ferry boats form Zakynthos to Kefalonia leave and for this reason it has one of the most equipped harbours of the island. 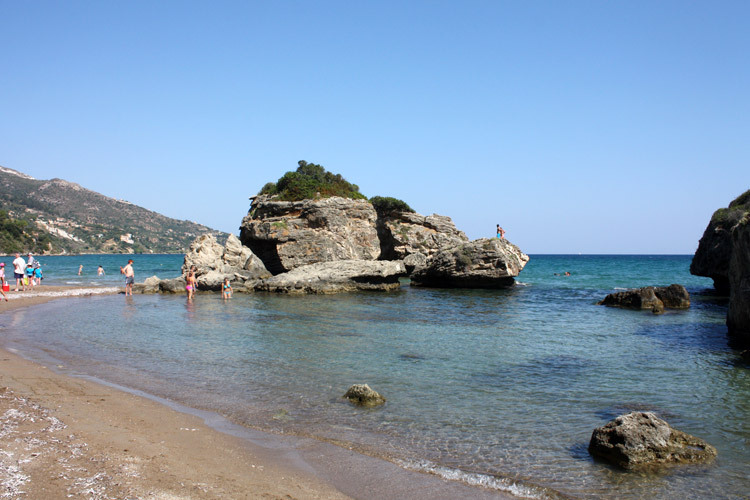 In front of the harbour there is an unoccupied small island reachable with a nice swim. 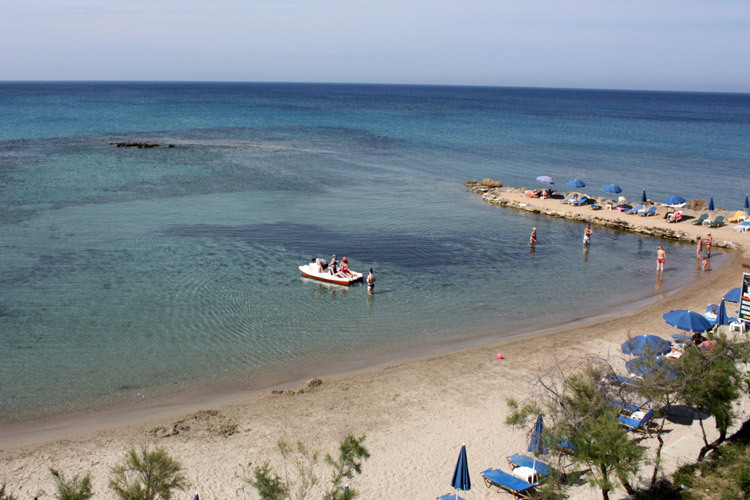 Makris Gialos A real postcard beach, a “must” during a holiday. The coast road leading to the beach offers from the very first moment a breathtaking landscape. This wide beach consists of a mixture of sand and pebbles and the sea is so beautiful that it seems to be stolen from a Caribbean beach. 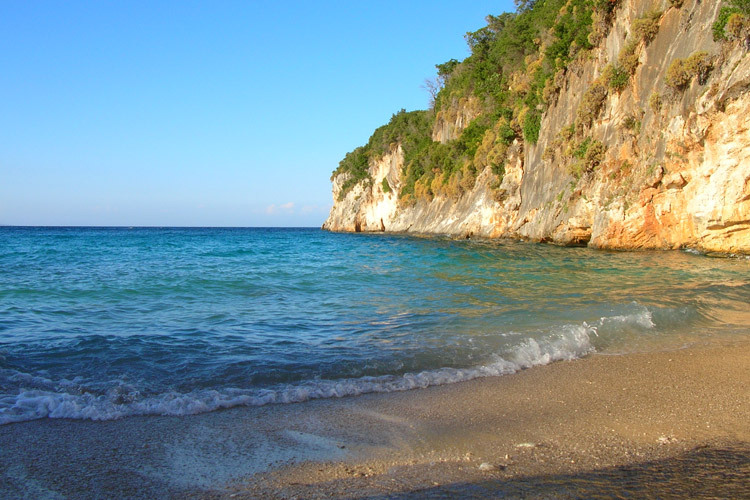 The waters are deep and beaches consist of rocks and sand; the sea in this part of the island is wonderful both for the waters clearness and the abundance of ichthyic flora and fauna. 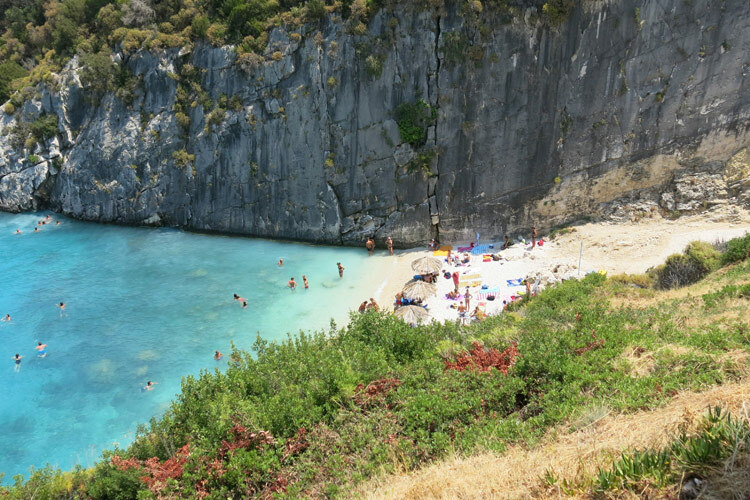 The snorkeling lovers should spend there at least two days: one to visit the coast that from the beach proceeds to the left and one for the right promontory. The coast around Makris Gialos consists of a series of underwater colourful caves and concretions; with an underwater torch you can enjoy the internal part of caves and tunnels and discover a world of corals and starfish. In the future the beach will be able to offer some tourist facilities; at the moment there are some refreshment areas nearby. 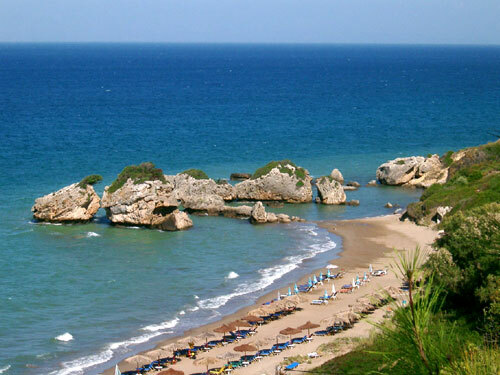 Xigia With the same name "Xigia" are called two different beaches which are the beginning of the northern part of the island, characterized by a rocky coastline with many bays and a wonderful sea, paradise for snorkelling. Coming from the south of the island you will find before the less famous beach which is reachable by an unpaved road (2 picture above). At the end of the unpaved road there is a car park and there are two paths: the first passes in front of the bar and go down with a staircase to the more sensational beach; the second one is more arduous and leads to a second beach much longer, deeper and usually uncrowded. 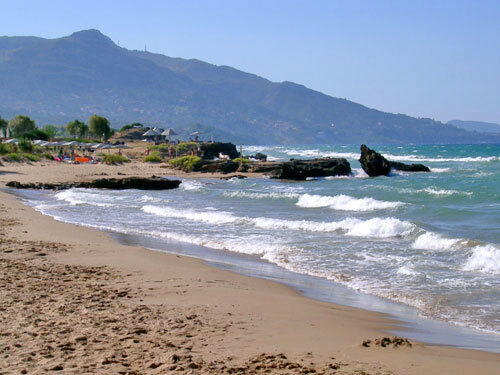 Otherwise if you go along the coast road you will reach the most famous Xigia beach (2 photos below). The beach is small but scarcely frequented, main characteristic is a marine cave with a sulphur spring extremely good for the skin. The only problem is the strong smell of sulphur coming from the cave and the cold water. Alykes In front of the homonymic village, Alykes’ beach embraces a wide gulf and consists of a long tongue of fine sand. 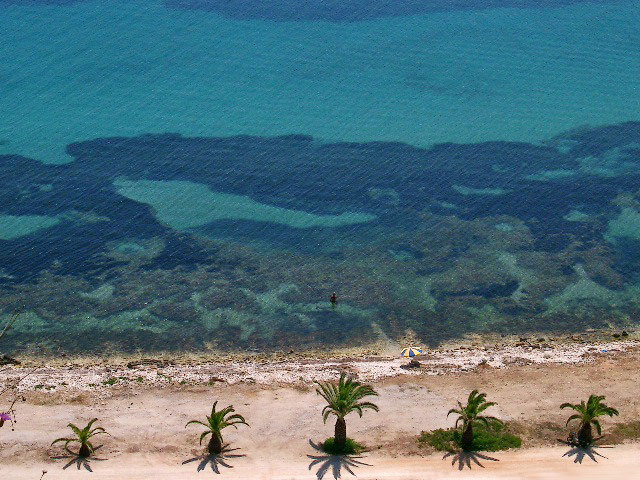 The bay is good for sunbathing in complete relax and also for enjoyments being equipped with water sports and snack bars. This beach is also good to stop for those who, leaving from the main town, intend to visit the northern part of the island. Alikanas Alikanas is the continuation of Alykes beach; it's the sandy tongue more to south of the gulf that ends with a small port for the fishing boats. 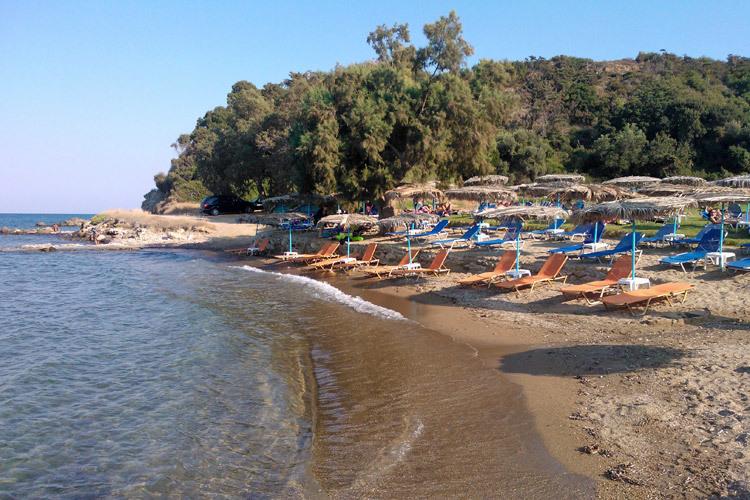 The beach is very spacious, equipped with deckchair and umbrellas and other facilities for the tourists like taverns near the sea, tour by boat in order to visit the Blue Caves and water sports. 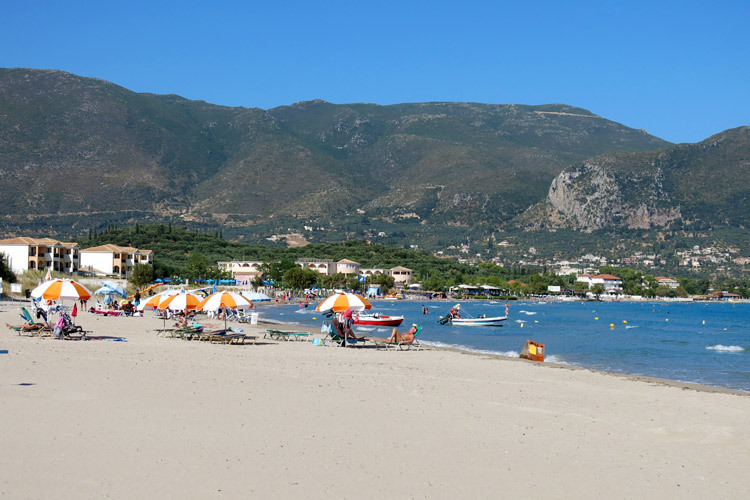 Alikanas is also the name of the old beach of the town that is not inside the gulf of Alykes but is a long the coast towards south. 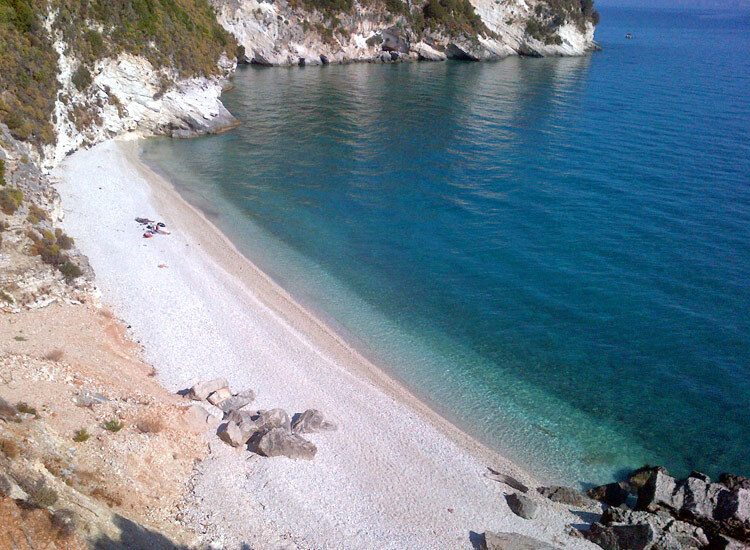 Smaller and less spacious than the most famous Alikanas, this beach offers more privacy, crystalline water and fine sand. It is not easy to find parking here because the final part of the road is no-asphalted and narrow and does not facilitate the maneuvers. 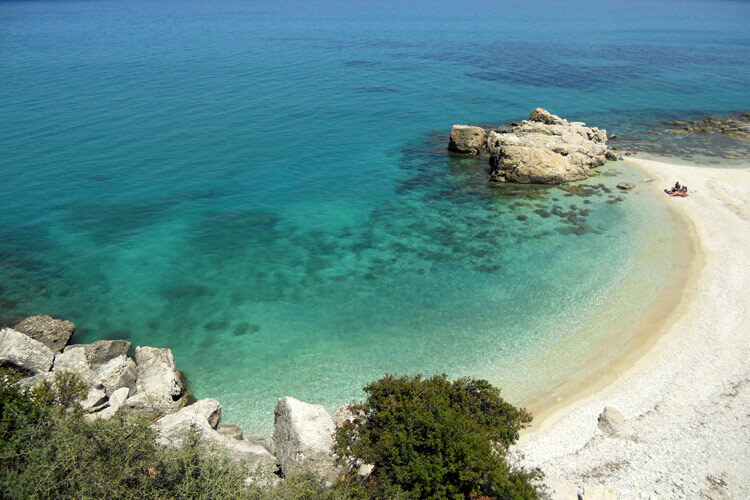 Psarou Psarou beach is a splendid long tongue of sand in front of a crystalline sea. It’s not very wide but it is situated in a quite area. 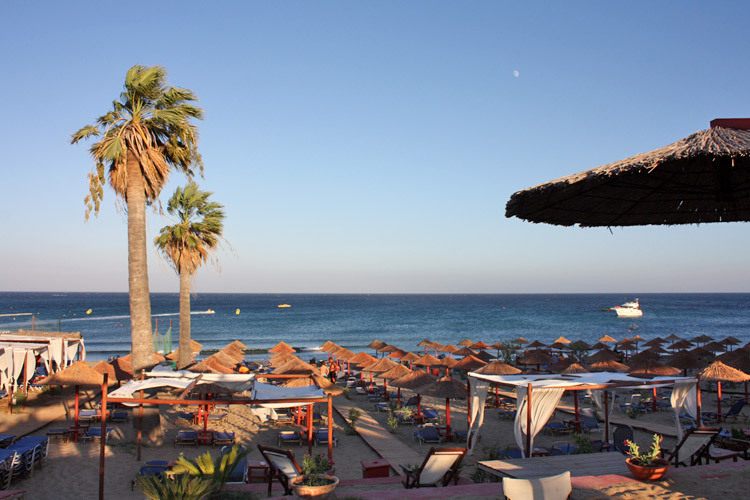 It’s the ideal place for those who are fond of relaxation because it is one of the less crowded beaches of the island. 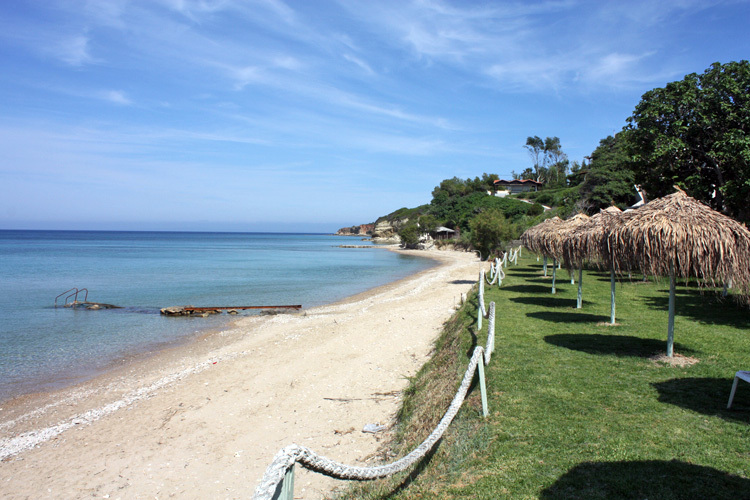 Ampoula Ampoula beach is located along the coastal road between Alykes and Tsilivì. It is a sand and pebbles beach sliding down mildly into the sea. There is an elevated and grassy level with deckchairs and sunshades for rent from where it is easy to reach the restaurants and the bar. Donkey From Zakynthos going north, one km after the village of Tsilivì, it is possible to take a road on the right reaching this beach that owes its name to the past presence of many donkeys. 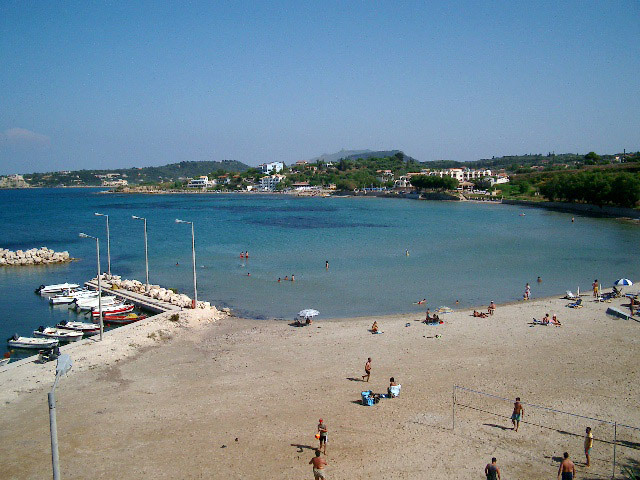 The beach consists of a small sand amphitheatre with a small harbour, very active in the past, nowadays only small fishing boats or private boats use it. There you can also play beach-volley and, except July and August, it is a quiet place. Tsilivi Tsilivì’s beach is one of the most tourist ones. It is a long tongue of sand and the sea has a sandy depth for the first 30/40 metres and from there rocks. 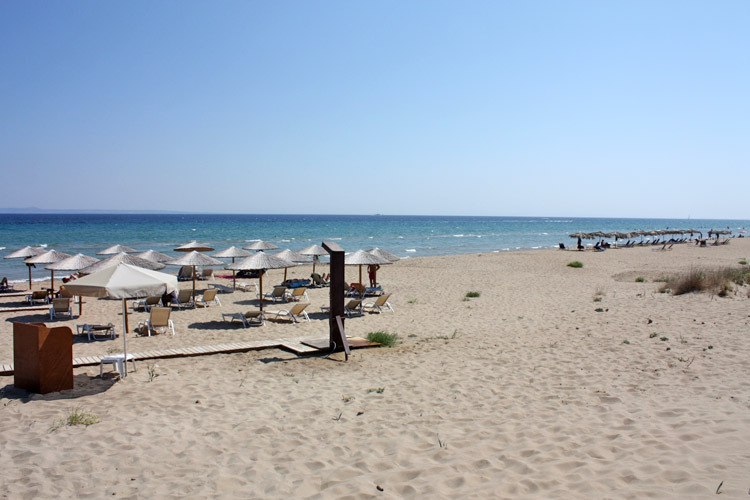 In the very large gulf of Tsilivi, in addition to the main beach that is the biggest, there are at least 2 or 3 other smaller beaches with tourist facilities like bars, restaurants, sunbeds and umbrellas and a beach volleyball court. 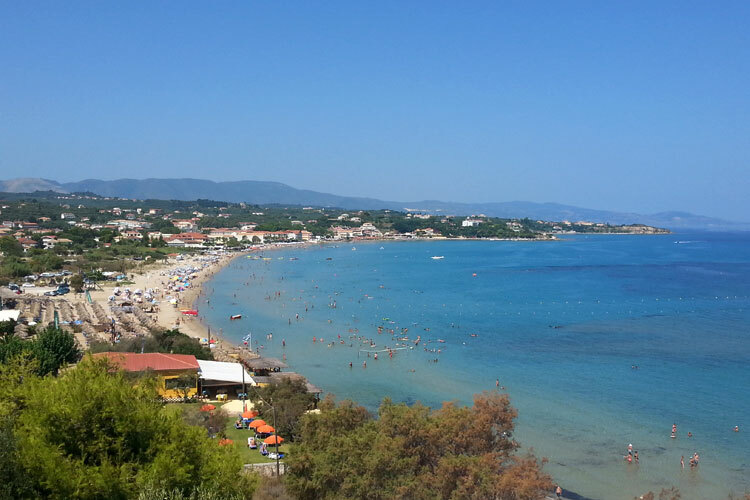 Krioneri Passing Zakynthos’ port pointing north, the beach coasting the sea is very long but narrow; it isn’t one of the best but there you can find different facilities like tennis courts, children fun parks and yacht clubs. In the week end the island inhabitants populate this beach. 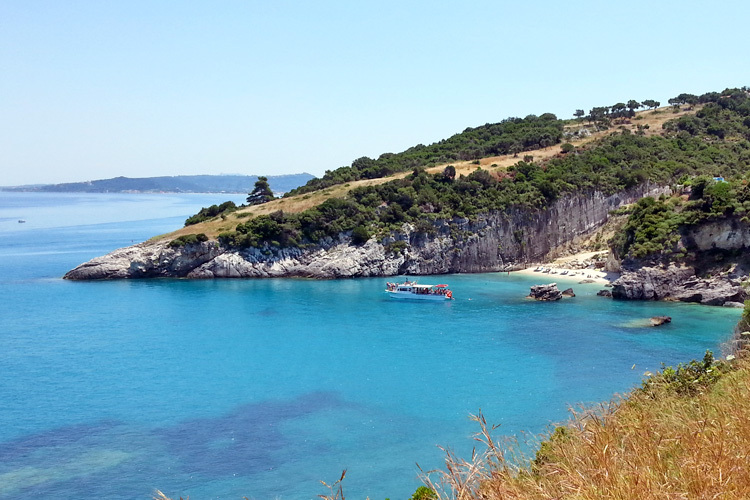 We suggest walking along the seashore passing Zakynthos' beach till Krioneri (where the road goes up). Here it is possible to park the car or motorbike in an area on the right and swim in a heavenly rocky sea. The sea depth is here crowded with octopuses. Argasi The gulf where Argasi beach is located is very beautiful to be admired at night coming back from Vassilikos towards Zakynthos. You can see both the small village of Argasi and the main town. 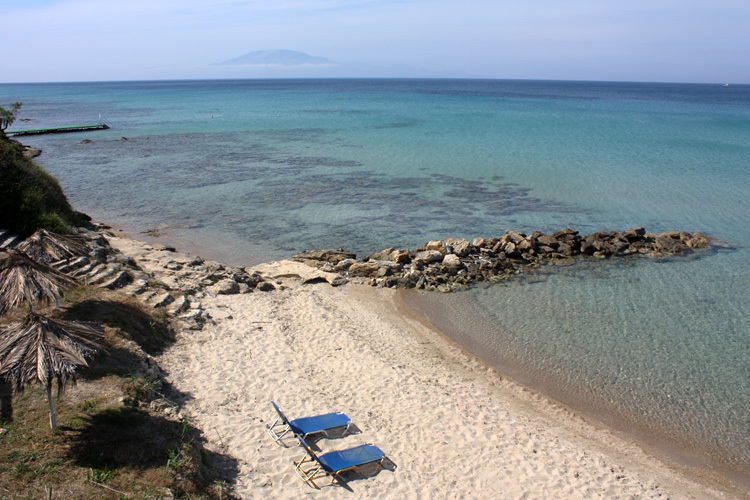 The small sandy beach has an ancient bridge partly based in the sand and partly in the sea. 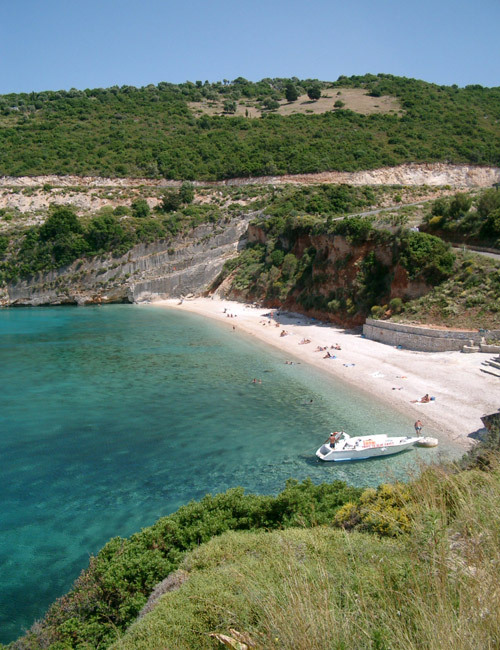 Porto Kaminia Located soon after Xirokastelo it is the first of many beaches of this tongue of land. 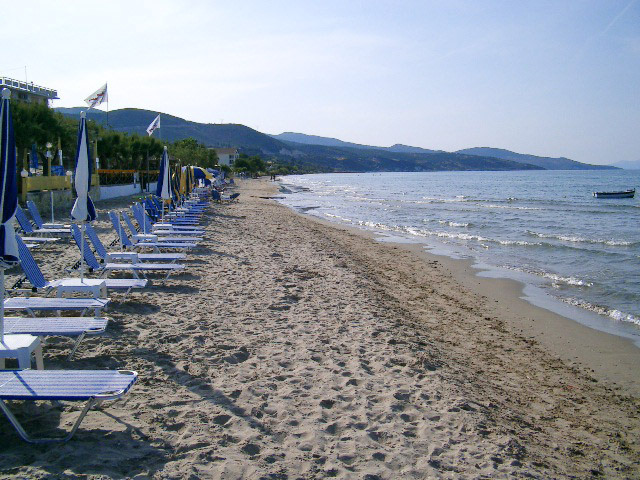 It is a sandy beach, long but narrow and at its back there is a lovely grass hosting sunshades and deckchairs for the tourist. 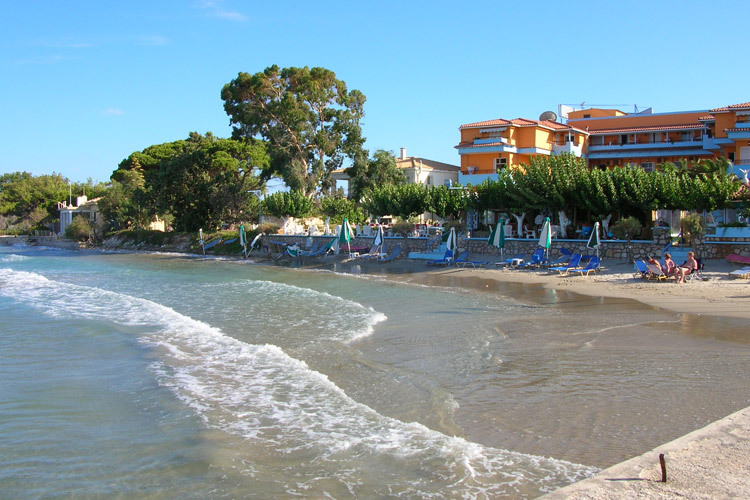 Porto Zoro It is one of the beaches in the southern part of the island completely sandy and with tourist facilities. Not far from the seashore peculiar rocks, assuming the shape of mushrooms, are the main characteristic of this beach. 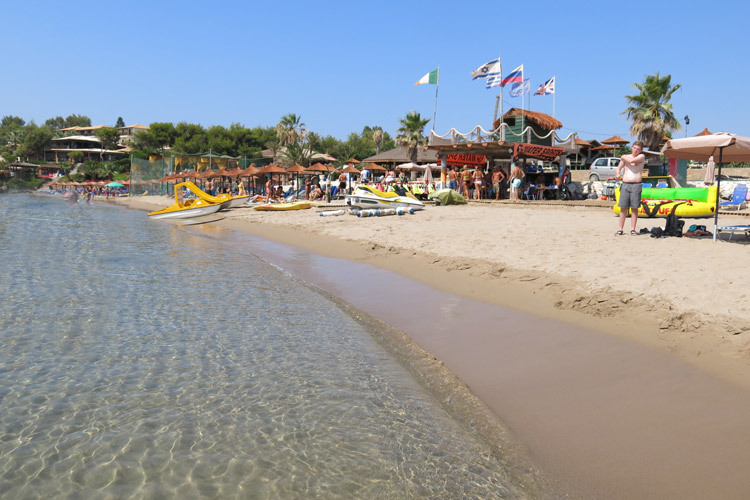 There are also sun loungers and umbrellas on the beach and over the grass behind the beach and a couple of bars with service to the sunbeds. Banana It is the longest beach of the island. Apparently never ending, this tongue of sand is also very deep and even if equipped for the tourist, it is far from villages and buildings. To get to the beach you have to reach and cross the surrounding pinewood along the largest road. Along the beach there are small refreshment areas. 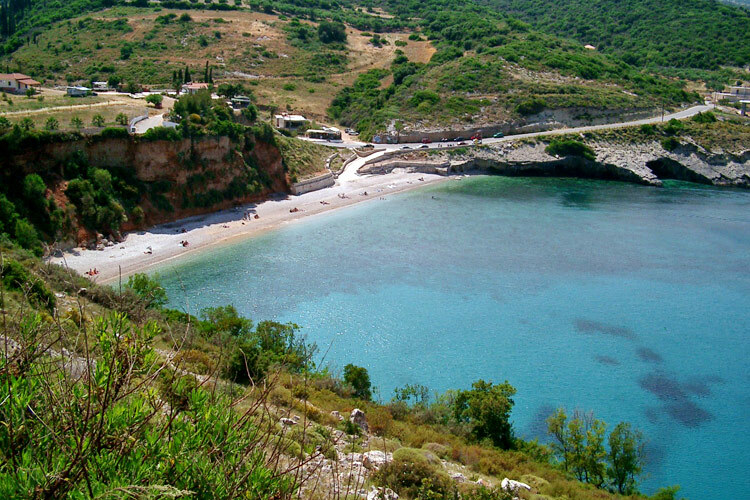 Saint Nikolas Once passed the pinewood you can find instructions about how to reach the beaches of Plaka, Ionio and Agios Nikolaos. They are all very similar, sandy and equipped to satisfy the tourist with taverns and bars where to rest in the warmest hours of the day. It is also possible to have fun with water sports like the parasailing: the thrill of being suspended in the air with a parachute pulled by a fast speed boat. 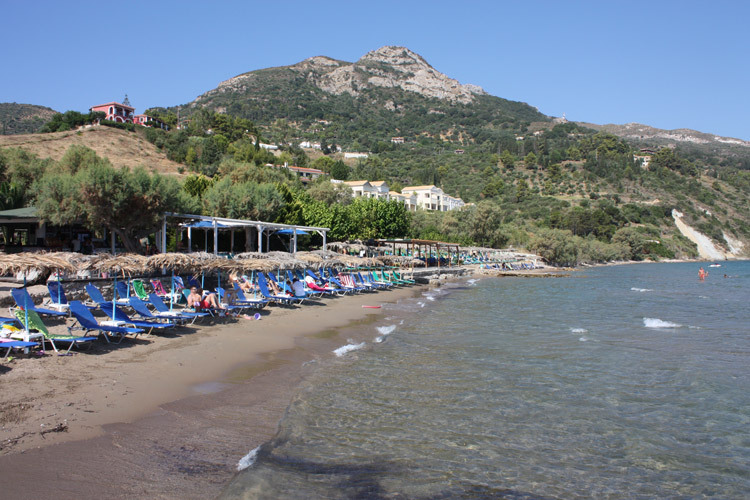 Plaka Very close to the beach of Nikolaos, Plaka is a small and quiet beach; there are no facilities for water sports but it is possible to rent sunshades and deckchairs. Walking along the beach it is possible to see small gods statues on the rocks a few metres from the sea. 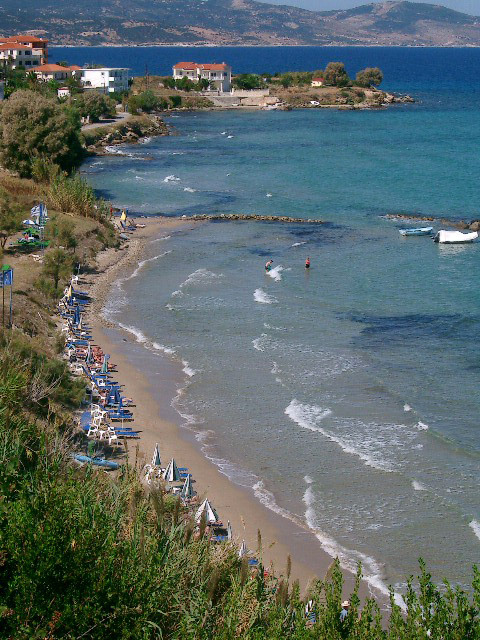 Porto Roma The last of the beaches of the western coasts, not including Gerakas that is facing the turtles gulf, it consists of sand too. Not really deep if compared to the other beaches, it offers the possibility to land with a small boat in the tiny harbour. 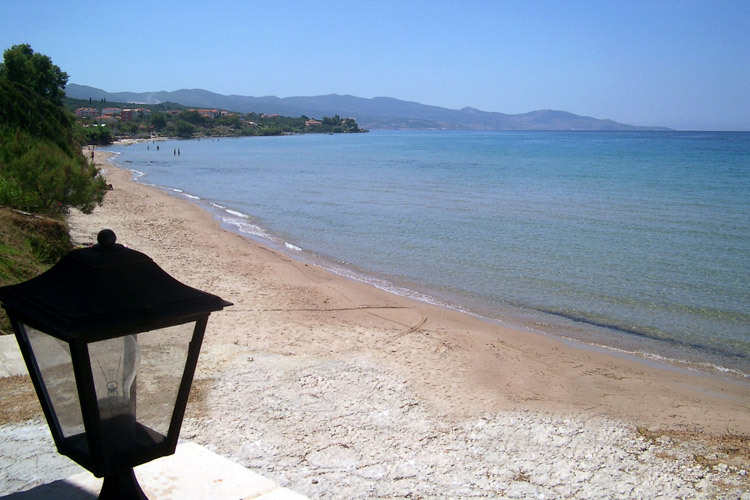 The name of the beach is dedicated to an important inhabitant of Zakynthos: Alessandro Roma that in this very place had his house.